Speaking at the NAACP convention in Florida, Attorney General Eric Holder discusses a few times he believes he was profiled, and that we as a nation need to question laws that "senselessly expand the concept of self-defense." On Tuesday Attorney General Eric Holder took issue with the so-called 'Stand Your Ground'-type of laws during a speech at the NAACP Annual Convention in Orlando. Meanwhile, demonstrations over the verdict in the George Zimmerman trial continued, with one protest in Los Angeles turning violent on Monday night. NBC's Ron Mott reports. More than 20 states have so-called "Stand Your Ground" laws, which became the subject of national debate after Zimmerman, 29, said he fatally shot an unarmed Trayvon Martin, 17, in self-defense on Feb. 26, 2012, in Sanford, Fla. The lobbying arm of the National Rifle Association didn't hold back in its criticism of Holder's speech. "The Attorney General fails to understand that self-defense is not a concept, it's a fundamental human right. To send a message that legitimate self-defense is to blame is unconscionable, and demonstrates once again that this administration will exploit tragedies to push their political agenda," said Chris W. Cox, the executive director of the NRA's Institute for Legislative Action. Holder's comments, in a long-planned address to the civil rights group, came amid other calls for a “Stand Your Ground” rollback. The Rev. Al Sharpton, president of the National Action Network and an MSNBC host, announced plans Tuesday for a campaign by clergy to get the laws off the books. A group of protesters marched on Florida Gov. Rick Scott’s office to demand a special session of the legislature to view Florida’s law. A spokeswoman for the governor said that soon after Martin’s death, he convened a bipartisan task force to review the law. “The task force recommended that the law should not be overturned, and Governor Scott agrees,” she said. Although the NAACP speech marked Holder’s first comments on "Stand Your Ground,” he has addressed the Zimmerman case numerous times since the Justice Department opened a probe into the shooting weeks after Martin was killed. George Zimmerman leaving the courtroom after being found not guilty on July 13. Holder, the nation’s first black attorney general said during Tuesday’s speech that Martin’s death reminded him of several incidents from his own past in which he was stopped by police even though he was doing nothing wrong. He reminded the audience that the Justice Department investigation remains open but was careful not to suggest that Zimmerman would be hit with civil rights charges. Sharpton and other Martin supporters have been pressing Holder to ramp up the Zimmerman probe, but legal experts say federal hate-crime charges are unlikely given the available evidence. "Usually when you have a successful prosecution, you have multiple statements made by the defendant about the victim's race while the defendant is attacking, or you have a group of people that went out looking for someone of a particular race to attack," said Samuel Bagenstos, a former top official in the Justice Department's Civil Rights Division. "Proving what's on somebody else's mind is as difficult thing to do in the law as possible." Martin’s supporters have said Zimmerman, a neighborhood watch volunteer who is of white and Hispanic descent, had a history of calling police to report “suspicious” black males in his gated community. The only juror to speak about the deliberations and acquittal told CNN this week that no one on the six-woman panel believed race played a role. 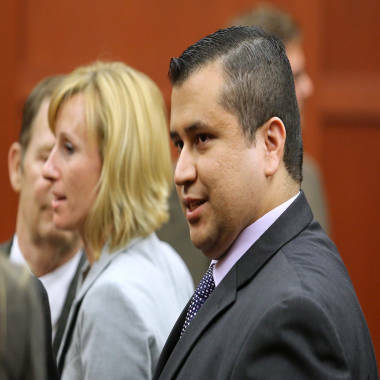 George Zimmerman has sued NBC Universal for defamation. The company strongly denies the allegation.